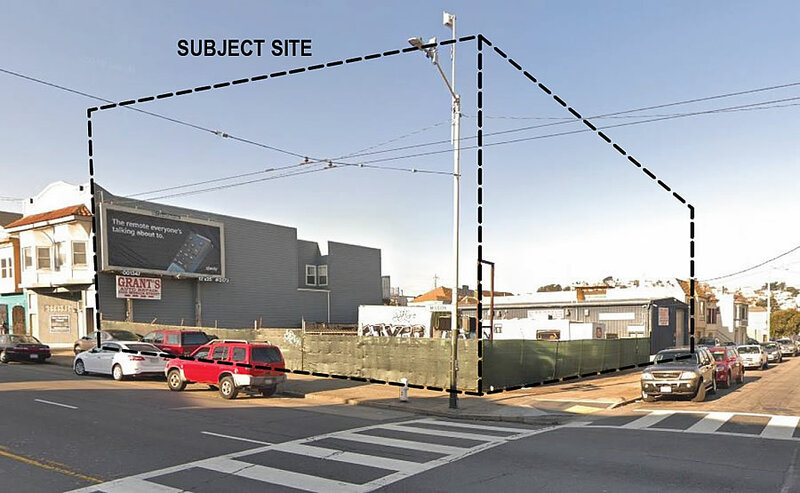 Purchased for $2 million mid-2016, plans to level the Grant’s Auto Repair shop and parking lot parcels on the southeast corner of Mission Street and Foote Avenue, on the border of the Outer Mission and Crocker Amazon, have been drafted. As we noted when the corner site was in contact, it’s zoned for development up to 40 feet in height, not including a possible bonus. 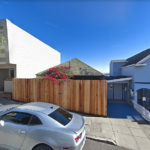 And as newly proposed, a four-story building will rise up to 45 feet in height, leveraging a 5-foot height bonus for active ground floor uses, versus a density bonus for even more height. And as envisioned, the development will yield 11 single room occupancy (SRO) units with a shared central kitchen and dining room, and a two-bedroom “owners unit” with a private kitchen (and living room), over a three-level elderly care facility (RCFE) with a total of 75 beds and a garage for one van. Build it …it’s the best looking perspective I’ve seen on here in a long time! 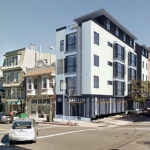 Info lacking, architect, developer, and more visual of what this is going to look like….